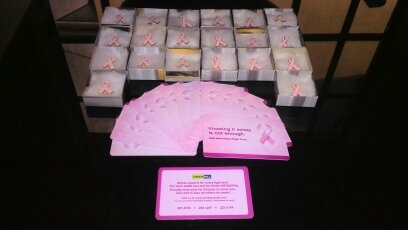 Spreading the word on Breast Cancer Awareness: Lia Acres is committed to the cause. “Sorry for the late response as I have been absent from the office for a short period. However, I would like to thank you for delivering the sample pins for our company to distribute. Please see attached for the picture display of the sample pins along with custom-made cards before delivery to 20 of our customers. These pins were mailed out so there are no pictures of distribution.